it was 97 Years ago, on the 09th of November 1914, that a battle took place between the German Cruiser "Emden" and the Cruiser "Sydney" of the Royal Australian Navy, just off Keeling Island. During the battle or in its result 140 sailors lost their lives. 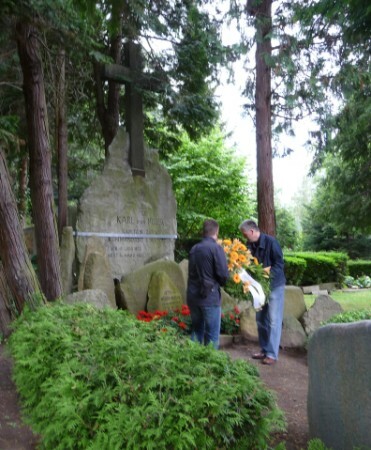 Today we lay a wreath and flowers at this tomb to honor the fallen sailors of both ships and also to honor the all-over-the-world renowned and respected Commander of the "Emden", Captain Karl von Müller. Why at the tomb of Karl von Müller and why just for these two crews? The small cruiser "Emden" waged a highly successfully war campaign as a single vessel, “Kreuzerkrieg”, in the Indian Ocean for three months at the beginning of World War I. Ships of the Allied Forces could no longer safely sail the routes in this region of the world. With her successes the ship under the command of Karl von Müller attracted attention and recognition from around the world. Units from various Nations started searching and hunting for this legendary ship, it was an exceptional effort. The "Emden" managed to escape this persecution for a further two months with skill, courage and luck, before she finally was tracked down by the "Sydney" and the battle ensued. During this battle of the two great cruisers "SYDNEY" and "EMDEN" on the 9th of November 1914 140 sailors on both sides lost their lives during the ninety minute firefight from the 105 mm and 150 mm guns, many were seriously injured and many more would die in the years following. The nautical skill, courage and humanity of the "Emden", combined with an attitude of sense of duty within the crew had written a unique chapter in the history of naval warfare. Karl of Müller's action was always marked by humanity. He had respect for all his adversaries by following human rights and respecting human dignity. He avoided causing casualties as much as possible and let the the defeated and captured enemy maintain their dignity at all times. The personal honor of crews of vessels seized remained always intact; they remained human at "eye level" with the victors and could look to the future with their head raised. This unusual act of fairness and chivalry soon earned him the unofficial nickname of "Gentleman of War". However, he was uncomfortable with this label as he was a very modest man for whom obvious matters were not worth mentioning. His special respect for human dignity is also reflected in another place, namely in his special talent for leadership. He respected the personal honor of his enemy as well as that of his own men. This created a faultless attitude, sense of duty, exceptional esprit de corps and readiness to make sacrifices of his crew. They were standing behind "the old man" true to the motto: "we go to fight every battle with this Commander"! "The noble, proud, and generous glowed like radiating from his face. He was restrained to the outside, but internally he took part in everything. He cared for and helped every subordinate who addressed him with his concerns, as he quite often did later at the prison camp. There we got to know him even better than it would have been possible on board a ship... Inner freedom put its mark on his nature; his character was so clear and balanced, nothing in his behavior was striking a pose or bad faith ... He gave confidence to his subordinates and gave them freedom to act as they had experienced the best results... Love and devotion, confidence and dedication as they have been given to Captain von Müller by his crew can be purchased only by pure human benevolence. What was really remarkable about him was that he was kindly disposed towards friend and foe in an identical manner..."
This spirit represents in a special way what Karl von Müller stood for. He passed it on to us, the descendants of his crew, and that is why this spirit for the Emden family is obligation! Let us follow the commitment by the today's wreath-laying ceremony in memoriam of the shining example and with the request that the victim of two crews was not in vain and calls for peaceful coexistence in humanity and human dignity in the future.